I'm a big fan of a quick, easy room makeovers that doesn't have to cost the earth. Many people put off tackling a room in their home for lots of different reasons. Money, time and experience seem to be popular ones. Where a big renovation job is concerned, these three reasons are 100% valid. I can't argue with that, having finished a top to toe renovation of our own house only recently. Stuff that scale swallows your money and anyone else's you borrow! But smaller makeovers on different rooms don't have to cost the earth. They don't have to take months and you really don't need a huge amount of experience to tackle it. All it takes is a bit of confidence and a willingness to give it a go. Sure how bad could it turn out if the room you want to makeover is already a site for sore eyes! That was how I felt about the utility room. It is behind the kitchen and is a narrow, dull room with no natural light. It made my eyes bleed every time I went into it. You can see how uninspiring the BEFORE photo is. 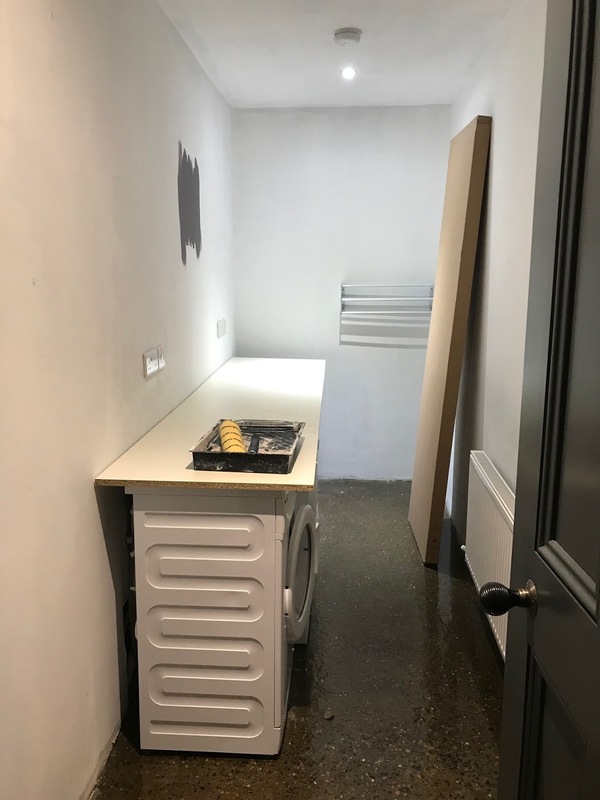 I have also included what used to be our kitchen/utility room before we added our extension, so you can see how different this area is and where all of our money went! Because said renovation which I mentioned before had swallowed up most of our cash, I had to get creative if I was going to do anything half way decent with this room. 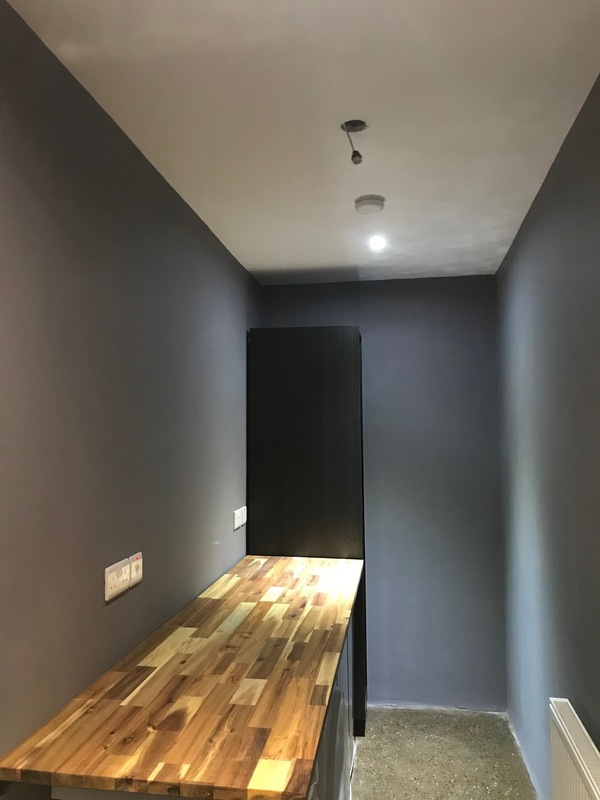 This is what I did and how I did it and I hope it gives you some inspiration to give that room in your home a similar treatment. I know paint isn't cheap, but it is the best way of changing a room you really dislike and help you fall in love with it all over again. Love is probably a strong word to use when referencing this utility room though. I only ever go in there to put on a wash, which I hate doing. My OH is much better at laundry than me, so I let him at it. I did however want more storage and a space to hang coats etc. The white on the walls didn't do anything for me. It was constantly getting scuffs and marks from our clothes horse and hoover. I decided to go dark. I have dark colours in some of the smallest spaces in this house and they work. People will say you are mad, that it will make an already tiny room feel smaller, that there is no natural light. Whatever. 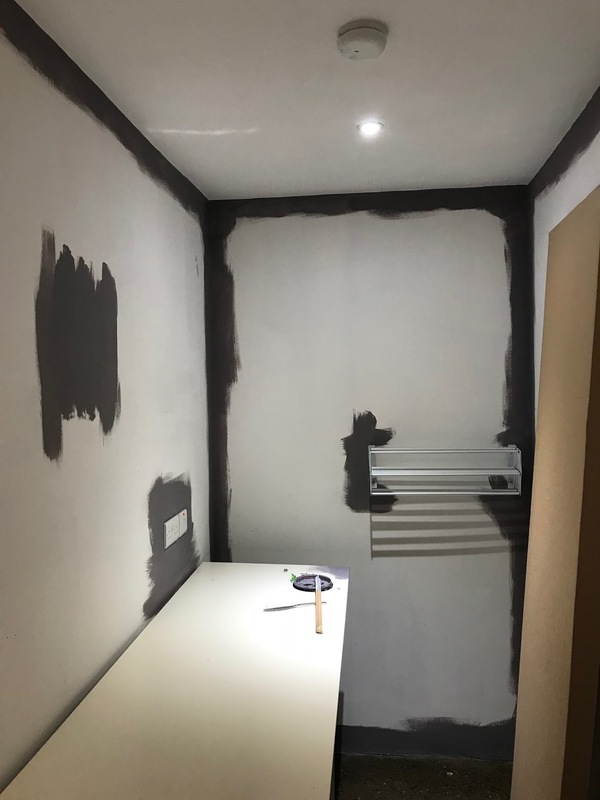 I painted it a dark grey, called City Break, by Crown Paints - I haven't used any Crown in the house before, but the quality of the paint was excellent. I used about 4 litres in a room this size. I tested the paint on the wall first - A tip would be to do this on some card or paper and stick it to the wall rather than have to paint over a section of the wall if you decide you don't like the paint, but I had the paint from a previous project and wanted to keep costs down, so used it. 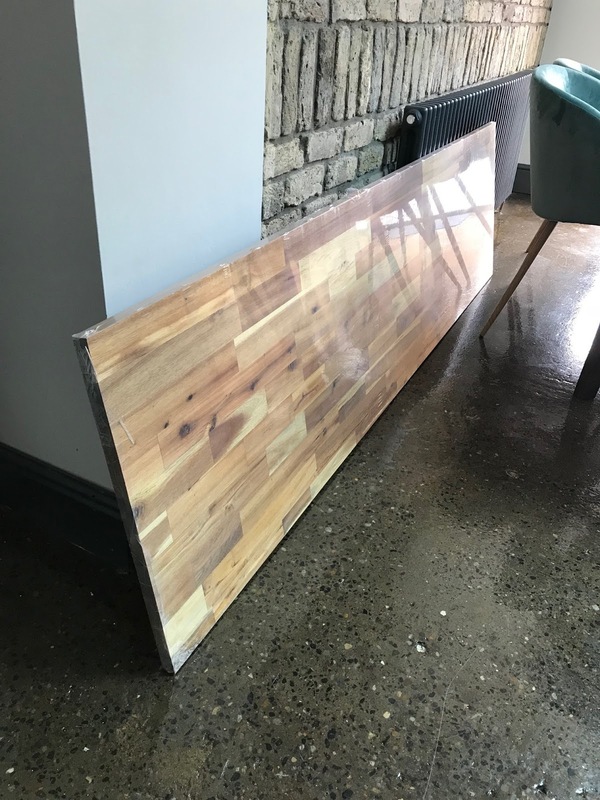 I spotted this 2.2 metre long solid acacia timber worktop in my local Homebase on sale for €45. I couldn't pass it. I had priced similar worktop from Ikea, but nothing was coming in as cheap. I had previously measured our appliances so knew this was the length I needed, with some room to spare. I bought it on the spot and managed to get it into the back of the car, while an audience watched on in the car park! A tip here is to have all your measurements for your room stored in your phone (I store mine in notes, or write them down and take a photo of them), that way you will always be able to make a decision on the spot, which is very useful. I needed a tall unit to store the hoover and ironing board, so I sourced a kitchen cabinet unit from Ikea. 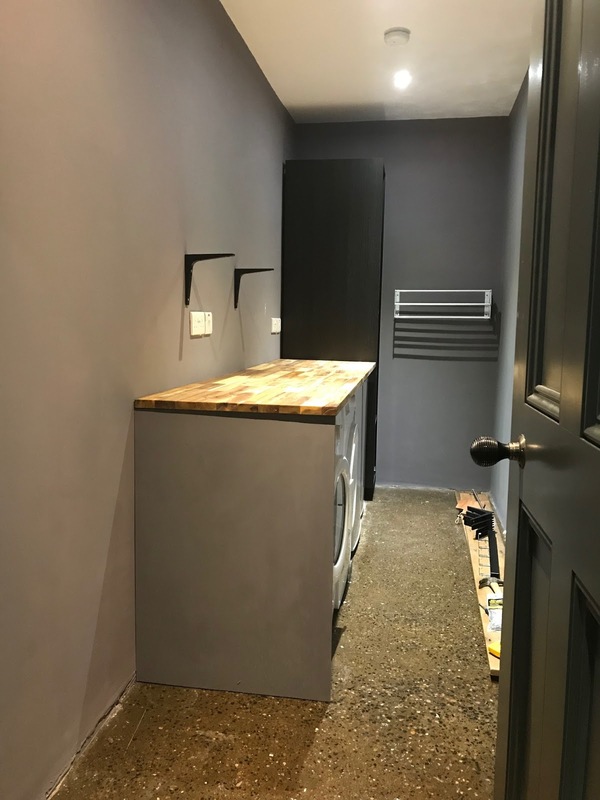 I went for the Metod High Cabinet frame in the dark wood effect and it is the 40 x 60 x 200 cm to allow me to open the utility door after the worktop and unit were both in place. You could cut your worktop to size and stack your washer dryer on top of another appliance if you were short on space. This was €75 and don't forget to buy the legs for them, which are about €8. This is an open unit, so no door required. I assembled the Ikea unit and fitted it at the far end of the room. Then I attached the worktop to a piece of timber I ran along at the back of the units. I cut an end piece from some MDF and fitted it to the end of the counter. I decided to paint this in with the wall colour, which ties it all together. I really wanted some open shelving for this room. 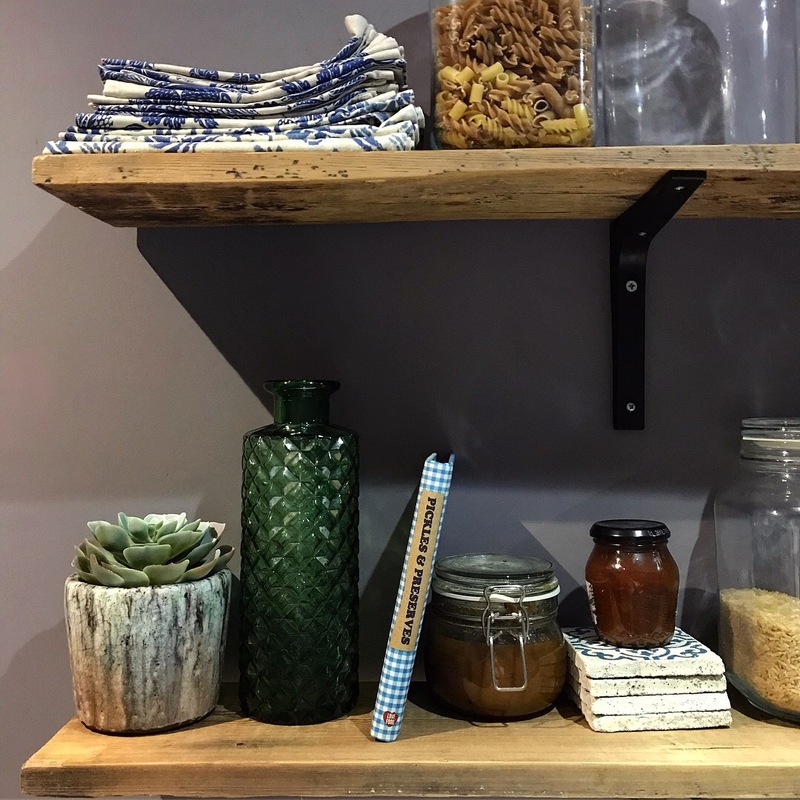 I make a lot of chutney at the end of the summer so I had in my head that open shelving would be handy and would also look cool. Luckily I had a few original floorboards left over from the renovation which were going to be dumped. I always wanted to find a new use for them, so I sanded them down, cleaned them and waxed them. The brackets are Ikea and were about 60 cent each. 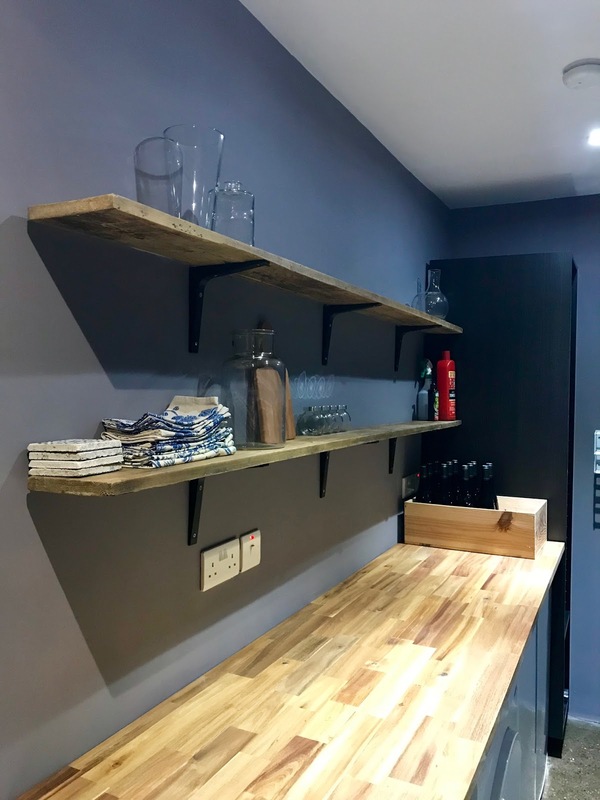 I fitted the shelves, which was super easy to do. I measured out the brackets and used plugs to attach the screws into the wall. I then attached the floorboards to the brackets, ensuring they were level all the way across. The waxed boards look really good and have a lovely feel to them. This now gave me the open shelves I have always wanted, at minimal cost! Win, Win! An inexpensive way to decorate this room was the brain child of my OH. 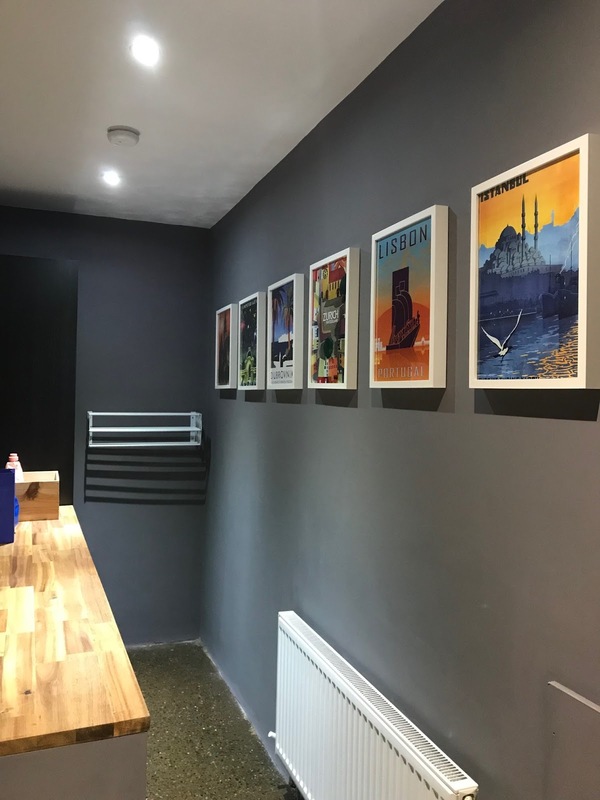 He sourced vintage travel posters on eBay of places we have been to over the years. This meant they would mean something to us and we would have good memories every time we saw them. I am not a fan of hanging some generic piece of art on the wall that means nothing to you. It is a wasted opportunity to add some personality to your home. These cost about €10 each and the frames came from Ikea. All in all, this room cost about €200 to make over. It was finished over a weekend too, with little disruption to the rest of the house. As I put everything back into the room, I got rid of anything I didn't like or need in that room. There was lots of storage now which can sometimes makes me feel under pressure to fill with stuff, but I resisted. The room now fits in with the rest of the house. It doesn't look sad and neglected any longer. 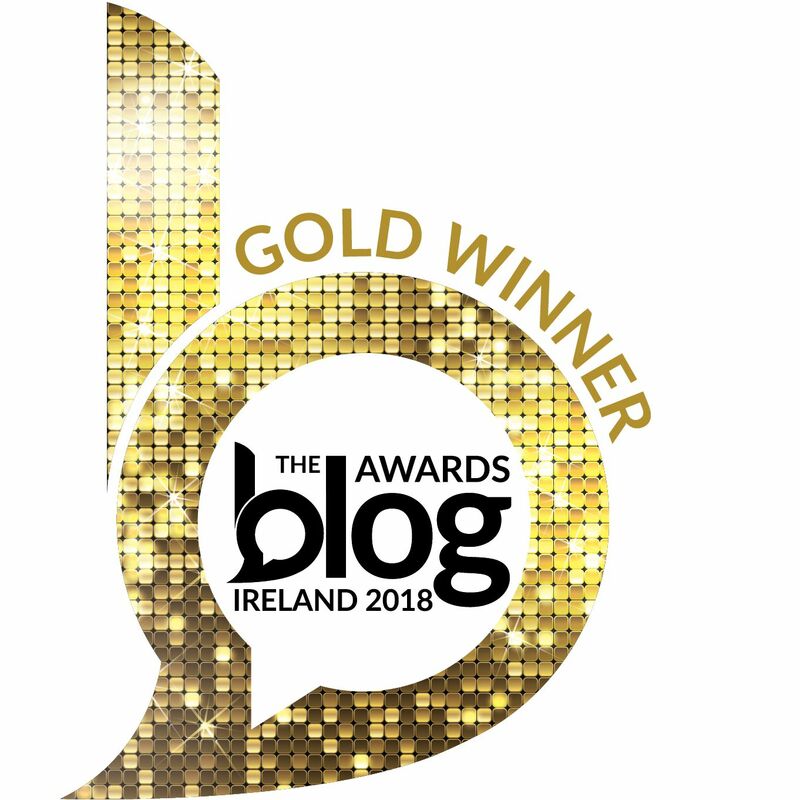 Moral of this blog post - Give a room in your home a mini makeover. Don't be scared. Make a list of everything you need for it, where you will buy it and how much it will cost. Then clear it out, buy some paint and make a start. Once you have committed to it, that is the first step. And when it is all done, you will be so glad you did. Best of luck with your project and as always, keep me posted on your progress! * Links are provided should you want a similar product, no products were sponsored!